ROEL WAGTER is Chairman of R. Wagter Business and ICT Architecture B.V. and has more than thirty years of experience in the information technology field. He has held numerous managerial positions in which he gained experience in the alignment between business and IT. These experiences are the foundation for his ideas on enterprise architecture. MARTIN van den BERG is Chairman of the architecture section of the Dutch Society of IT Professionals, and an enterprise architect and service line manager with Sogeti Nederland B.V. He advises and trains companies in applying enterprise and IT architectures. In addition, he develops services to support organizations to improve the way they work with enterprise and IT architecture. JOOST LUIJPERS is an information architect with Sogeti Nederland B.V. Prior to joining Sogeti, he was a professor of information engineering. MARLIES van STEENBERGEN has more than ten years of experience as an enterprise architect. She now works for Sogeti Nederland B.V. as an advisor and coach in the field of enterprise architecture, and chairs Sogeti's Architectural Competence Network. Chapter 1: Agility and Coherence: A Conflict of Interests? Chapter 2: Agility and Coherence Considered Separately. Different Answers to Different Questions. Increasing Agility: New Development Methods. 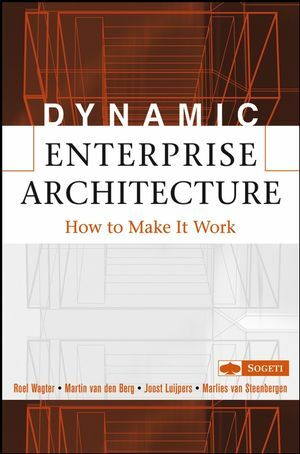 One Answer to Both Questions: Dynamic Architecture. Dynamic Architecture: Architecture Aimed at Agility. Quickly Achieving Business Objectives: DYA. Chapter 4: The DYA Model. DYA: A Theoretical and Working Model. The Model and the Principles. How to Use the Model. Strategic Dialogue: Doing the Right Things. Strategic Dialogue: Coherence and Agility. Intermezzo: The Business Case for WWW-TeleBel. Architectural Ups and Downs at TeleBel. Architectural Services: Doing Things Properly. Maintaining an Overview with the Architectural Framework. Architectural Services Supports the Strategic Dialogue. Architectural Services Supports the Development. Architectural Services: Coherence and Agility. Chapter 7: Development with(out) Architecture. Development with(out) Architecture: Doing the Right Things the Right Way. Offensive Strategy and Defensive Strategy. Development with(out) Architecture: Coherence and Agility. Intermezzo I: A Building Permit for WWW-TeleBel. Intermezzo II: A Management Letter for WWW-TeleBel. Successful Processes Do Not Just Happen. Intermezzo: Embedding Dynamic Architecture at TeleBel. Appendix A: Technique for Interactive Process Design. Appendix C: Architecture Maturity Model and Dynamic Architecture.